Dr. Charles J Prestigiacomo, MD is a Doctor primarily located in Newark, NJ, with another office in Cincinnati, OH. He has 26 years of experience. His specialties include Neurological Surgery. He speaks English. Dr. Prestigiacomo has received 1 award. The overall average patient rating of Dr. Charles J Prestigiacomo is Excellent. Dr. Charles J Prestigiacomo has been rated by 1 patients. From those 1 patients 1 of those left a comment along with their rating. The overall rating for Dr. Charles J Prestigiacomo is 5.0 of 5.0 stars. Most compassionate, skilled doctor in the world! He is truly a miracle maker! He performed the most difficult, uncommon surgery on my aneurysm, and I have no side effects!! Love this man!! He is an angel! ! We are sorry, it looks like we don't have insurance information. Please call Dr. Charles J Prestigiacomo's office for more information. 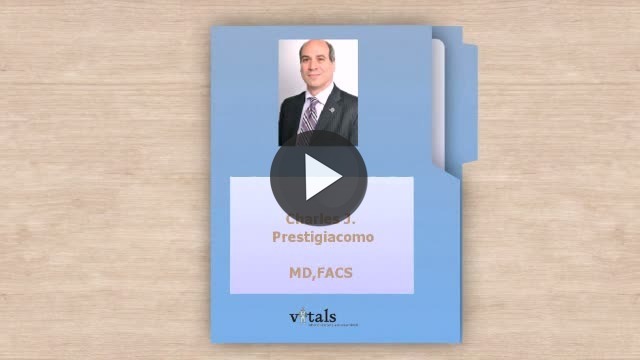 Take a minute to learn about Dr. Charles J Prestigiacomo, MD - Neurological Surgery in Newark, NJ, in this video. Dr. Charles J Prestigiacomo is similar to the following 4 Doctors near Newark, NJ. Have you had a recent visit with Dr. Charles J Prestigiacomo? Select a star to let us know how it was.